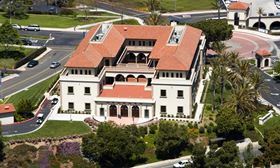 The Degheri Alumni Center, the administrative centre of the University of San Diego. 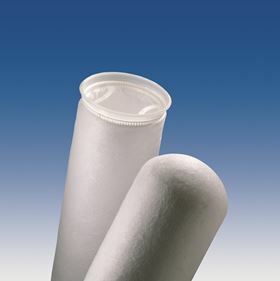 Pall Water's 10-micron Polyfold filter bag has the ability to handle higher flow rates. When the University of San Diego began experiencing HVAC issues, clogging prevented the equipment from reaching its set points. Pall Water's filters enabled the systems to consistently run at lower speeds while maintaining the correct temperatures and also bring about maintenance and energy savings. In 2014, the University of San Diego began experiencing HVAC issues in several buildings across campus. As cooling coils experienced sediment buildup on the inside, the maintenance team lost its ability to control temperatures in certain zones due to the clogging which prevented the HVAC equipment from reaching its set points. Initially unable to pinpoint the exact cause, the school’s maintenance team eventually discovered that sediment buildup in the university’s 18 in chill water distribution system was causing cooling coils to clog, which prohibited the building’s air conditioning units from operating properly. To restore proper HVAC functionality, technicians were required to manually back flush coils on the roof of each affected building to remove the sediment. This process took several hours, putting a significant strain on the maintenance teams' time and resources. The issue became more critical when sediment buildup broke free in distribution pipes as pumps reacted to summertime temperatures. As a result, classrooms and facilities across campus had cooling coils clog, leaving many classrooms without air conditioning. A rapid solution was needed to deliver comfortable temperatures to faculty, staff and students. The Degheri Alumni Center, which houses a variety of administrative offices and conference rooms, was identified as the most problematic building on campus, and thus, the maintenance team’s target. It sought to fix the most troublesome building to alleviate the largest strain on the maintenance team’s time and resources. Standing at three stories and 28,000 square feet, the Degheri Alumni Center is located on the outer perimeter of campus, making it most prone to sediment buildup. Upon receiving a recommendation for Pall Water's filter bags, the University of San Diego's maintenance team met with Pall Water to explore which products would solve the university's challenges. After evaluating many options, Pall Water's 10-micron Polyfold filter bag was selected due to its ability to handle higher flow rates; this allowed the University of San Diego to use a single bag housing instead of a larger multi-bag housing. As an added bonus, the bag filters are easy to remove, allowing the maintenance team to positively identify that sediment buildup was the cause of these challenges. Immediately, the maintenance team noticed the positive impact of the filters, and could see the larger particles collected in the filters that were causing the havoc. After a few months, the University's maintenance team and Pall Water technicians decided to move down to a 5-micron Polyfold filter bags to further optimize results and remove more sediment. Able to handle flow rates of 200 GPM, the filter bags’ strength and performance have helped completely resolve the Degheri Alumni Center’s HVAC issues caused by sediment in the incoming water. Most notably, the utilization of Pall Water's Polyfold bag filters has greatly reduced the strain on the University of San Diego's maintenance team. Technicians are no longer required to spend half a day on the roof of the Degheri Alumni Center every 4-14 days as was previously needed. Now, technicians simply swap out the filters every 1-2 months, an exercise that only takes 10 minutes. The use of Pall Water's filter bags has saved the university dozens of man power hours per week. Maintenance workers are now freed up to perform other activities beyond clearing out air handlers. “The technicians absolutely love these filters as they no longer waste several hours cleaning out clogged coils on the roof, and our building occupants are pleased that they no longer have to file work orders complaining about the lack of air conditioning in the Degheri Alumni Center,” said Steve Glover, Facilities Engineer, University of San Diego. Beyond saving time and resources, the university's technicians are now able to proactively determine when filters are nearing capacity. A differential pressure gauge and daily measurements allow technicians to replace filters before the sediment buildup impacts building temperature. Before deploying the filter bags, the university's maintenance team had no insight into when buildup was occurring. Technicians had no other option than to be reactive once work orders were filed by the building's occupants. By employing a gauge to track the useful life of filter bags, the university's maintenance team has solved an inconvenient and time-consuming problem. Building occupants are no longer required to file work orders related to the Degheri Alumni Center's air conditioning issues. Given the filters' ability to solve the university's problem, it is considering implementing the filters in other buildings across campus. The ability of Pall Water's filter bags to solve temperature control challenges resulting from sediment buildup has also improved equipment lifetime. With all of the buildup on coils within the HVAC systems, the equipment's heat transfer was compromised, adding unnecessary wear and tear that would have impacted the equipment's lifecycle. Following the implementation of Pall Water's filters, the HVAC systems are able to consistently run at lower speeds while maintaining the correct temperatures. This has undoubtedly resulted in energy savings as the HVAC systems were previously operating at much higher levels. These energy and man hour savings provided the university with a quick return on investment related to the cost of installing the filter. Pall Water's polypropylene microfiber bag filters solved the University of San Diego's temperature control issues caused by sediment buildup, while also resolving an extremely time-consuming and inconvenient issue for the university's maintenance team. Allows customers to resolve potential issues. A Pall Corp mobile water treatment system was used to provide clean drinking water in New Zealand following the recent earthquake.